Dr. Victor Yuzefovich, Russian musicologist and former editor of the U.S.S.R.’s leading music magazine, Sovetskaya Muzyka, presented a biographical account of the life of famous violinist David Oistrakh. PROVO, Utah (Oct. 21, 2016)—What was life like for Soviet musicians in the former U.S.S.R.? At a recent Russian lecture, Dr. Victor Yuzefovich, musicologist and former editor of Sovetskaya Muzyka, discussed the life of famous violinist David Oistrakh and his legacy as an artist. Oistrakh was born and raised in Odessa, Ukraine, a city located on the shore of the Black Sea. When Oistrakh was just three-years old, his father brought home a toy violin, which he played with the child-like hope of one day become a street musician. Little did he realize at the time that he one day would become one of the U.S.S.R.’s most talented classical performers. As a child, Oistrakh studied under Pyotr Stolyarsky, one of the founders of the Soviet violin school. In 1926 when Oistrakh graduated from the Odessa Conservatory, he had already debuted and participated in a variety of notable orchestra performances across Ukraine. In 1928 when Oistrakh was just 20 years old, he established his residence in the capital city of Moscow where his talent was still unknown. As a young man Oistrakh came out on top in many music competitions held across the U.S.S.R and Europe. Yuzefovich shared an account of jurists in one of Oistrakh’s competitions who quickly stopped taking notes on his performance simply because they couldn’t help but listen to and enjoy his unique performance. 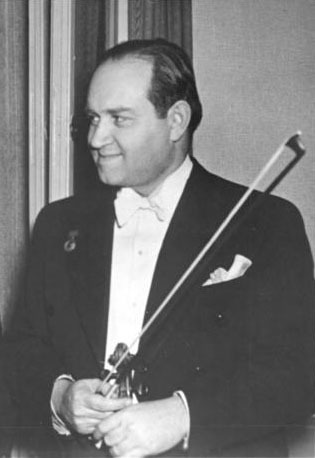 Oistrakh’s presence as a musician was particularly notable during WWII. Throughout the war, according to Yuzefovich, Oistrakh continued to play concerts in the U.S.S.R. His presence was also felt across Europe and America as music lovers would tune in to Soviet radio broadcasts just to hear him play. Yuzefovich added that though alarm sirens began to howl just as Oistrakh began to play, nobody got up to leave; Yuzefovich played on, completing his concerto. “In Oistrakh, Europe saw not only a musician, but also a representative of the culture of the people, its liberators,” Yuzefovich said. To conclude, Yuzefovich discussed Oistrakh’s unique qualities as a musician and why his history matters. “When one wonders about Oistrakh’s performance style, the first thing that comes to mind is a perfect blend of his artistry as a result of incredible combinations of subjective and objective beings,” he said. Sylvia covers events for the Department of German and Russian. She is a senior pursuing a double major in English and French with a minor in women’s studies.